What is Over 40's Rugby? There are several teams in the Northwest over 40s league. As an Evergreen you get to play agains teams from Vancouver, Vancouver Island, the Fraser Valley, Kelowna and Seattle. The following suggestions should be adhered to as a mode of play by everyone playing the game within the Pacific Northwest Over 40’s Rugby Union. Given sufficient consideration to the age of the participants in Over 40 rugby, games should be played in accordance with the most recent Laws of the game of Rugby Union Football that have been sanctioned by the British Columbia Rugby Union. The length of the game shall be determined by an agreement between the captains of the teams. Games will generally be 60 minutes in duration with three periods of 20 minutes. Substitutions should only be made at a stoppage in play. There is no limit as to the number of substitutions that may be made, nor as to the number of times that player may rejoin a game. Tackling and other physical contact that is a part of the game of rugby should be modified to take into account the age of a player as signified by the colour of the shorts worn. As a rule no Over 40 club should use an underage player. This rule has been modified on occasion to assist developing clubs, however the following guidelines should be followed when a club wishes to play an underage player. Underage players must be identified as to name and age before the game and may only play with the agreement of the captain of the opposing team. Clubs should make every effort to have certified referees available to officiate games. The referee must officiate an Over 40 game with the same regard for the Laws of the game as he would have officiating in any other Union affiliated with the B.C.R.U. It is also desirable for clubs to schedule a session with a certified referee to review changes in the Laws of Rugby Union Football at the beginning of each season. An Over 40 player who has been suspended from play by any Union affiliated with the B.C.R.U or the C.R.U. or any other national Union will not be eligible to play until the terms of his suspension have been met. 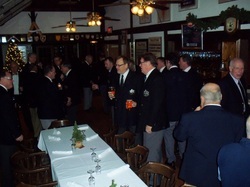 Evergreens Annual Christmas Dinner at our Clubhouse in Brockton Pavilion, Stanley Park. Another great social side to our Over 40's Rugby Club.